By capturing the highest score in the World Championship Semifinals competition, The Cavaliers (1st-97.875) may have secured two out of three shows at the Drum Corps International Division I World Championships, but the mystery as to the final placements is anything but etched in stone. Blue Devils (2nd-97.000) is less than a point away from springing into the top spot and Phantom Regiment (3rd-96.825) is just a shade over a point away. The Green Machine enjoyed the biggest increase in score of the top three corps from the Quarterfinals competition, and a .6 increase in visual performance from Thursday assisted that jump. 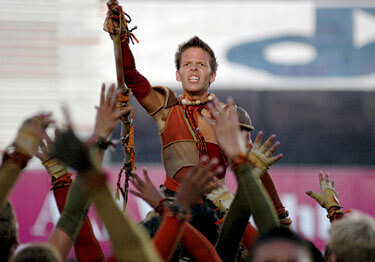 Madison Scouts perform in Friday's Semifinals competition. Blue Devils also dropped in percussion, but managed to pull out a tie for second in the caption with Bluecoats. Once again, the corps took high color guard, but took second to the Cavaliers in general effect visual, visual performance and visual ensemble, and second to Phantom Regiment's winning percussion score. For the second night, the corps also took third in music brass and music ensemble. Phantom Regiment's percussion has never taken top honors at the DCI World Championship, but that could change this year. The corps also took over first in general effect music from the Cavaliers, took second in brass and music ensemble and placed third in all other captions. Make no mistake, fans could be talking about any combination of placements among the top three before Saturday turns into Sunday. In Thursday's Quarterfinals, the next three corps were separated by 1.1 points. In Semifinals, that range shrunk to just .125, giving us a secondary race that is as exciting and unpredictable as the race for the top position. The Cadets (4th-93.625) remained in the same position from the night before, but Santa Clara Vanguard (5th-93.550) barely snuck past Bluecoats to place aim on perhaps jumping one spot each night. The Cadets' percussion placed 8th, .75 under Bluecoats' line. Bluecoats (6th-93.500) stayed in the hunt for fourth place by the merit of their high percussion score and top-tier scores in general effect music (4th), brass (4th) and music ensemble (5th), making music overall the corps' leading ace. On Thursday, Carolina Crown, Blue Knights and Boston Crusaders were all within the same .35 spread, but on Friday, Carolina Crown (7th-90.275) opened up a .925 point spread over Blue Knights (8th-89.350) and a 1.5 point spread over Boston Crusaders (9th-88.775). Once again, Crown's percussion placed 12th and the corps general effect scores for visual and music remained identical. Minor increases in most other captions accounted for the larger spread over the other two corps. Blue Knights dropped .5 in visual ensemble and Boston Crusaders dropped the same spread in overall general effect and .4 in color guard. Madison Scouts (10th-87.950) opened up a 1.675 point spread over Glassmen (11th-86.275) after edging the corps by just .125 the night before. Spirit from JSU (12th-85.275) secured the final spot in Finals for the second year in a row. The remaining corps in Semifinals include Colts (13th-83.050), Blue Stars (14th-81.525), (who jumped a spot from Quarterfinals), Crossmen (15th-81.250), Capital Regiment (16th-80.825) and Mandarins (17th-77.875). A fantastic highlight of the evening was the 225 members of the Madison Scouts Alumni Reunion Project, playing a number of great tunes from the stellar repertoire of greatest hits so beloved by all drum corps fandom.